Tell us a little bit about yourself and your background with music, education, or social justice work. I have a long history of volunteerism and work in the Human Services, education, and community organization based fields. I love helping with causes that I feel are important and many of them have been arts-related or education-based. 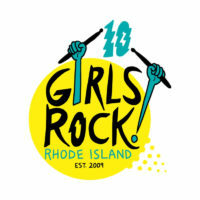 I was drawn to Girls Rock when I first heard about it happening in Portland, Oregon and then saw that there was one in Boston, and started to research shortly after that if there was one in Providence. I didn’t start getting involved though until after I participated in Ladies Rock camp where I got to live my dream of being on stage as a vocalist in a rock band and wanted to help deliver that experience to others. Outside of volunteering and Girls Rock, I am focusing a lot on food justice and healthy lifestyles and learning how to become a better educator around these topics. For musicians: Are you currently playing music? If so, tell us about it! Right now I’m not doing much musically because I’m trying to finally finish my bachelor’s degree and I don’t have enough time to practice music. I do have some ideas I eventually want to try, like making amplified music out of one of my longest surviving toys from when I was young– a vintage Muppets Casio keyboard. What are some awesome bands featuring female-identified musicians that you are listening to right now? –Shonen Knife is forever one of my favorite bands. -Bjork’s band The Sugarcubes I still get a kick out of listening to. -Someone said my band at Ladies Rock sounded like Kleenex/Liliput and ever since then I’ve been a fan of them. Here is a YouTube video of my favorite song by them. What is your role at Girls Rock! Rhode Island? In my own words? I am the person who feeds everyone and fuels the rock. I am also occasionally that person who is telling you to eat or take food home even when you don’t want to think about eating food anymore. 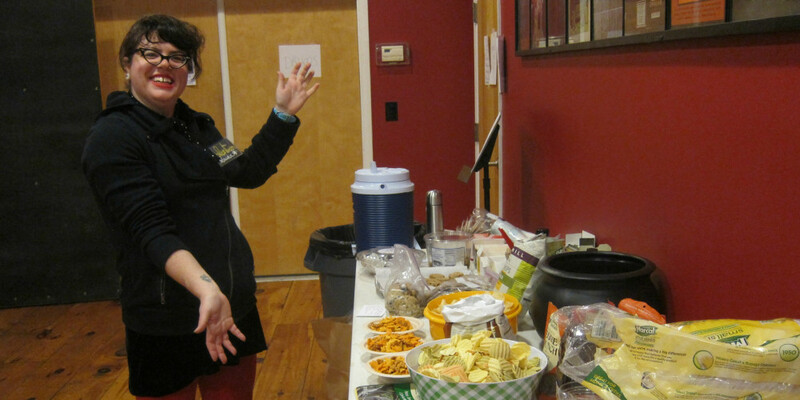 Also, I take a lot of pride in taking special care and accommodating people who have special dietary needs, such as vegans, vegetarians, gluten free folks, and more. I am a vegan myself, and GRR! is really an awesome place to test out the recipes I create for my food blog, Banana Curl, Vegan Girl. What is your favorite camp or after school moment? Why do you think someone should volunteer for Girls Rock! Rhode Island? Because they really do rock! More seriously though, I believe I personally have a duty as a woman to help other women and girls achieve their dreams. Girls Rock was something I would have nearly died to go to as a teen myself, it would have seriously been the coolest thing. So I want to make sure that girls today are able to go and keep being involved with. I am always urging everyone I know to get involved if they can. I feel like it is a life-changing experience for everyone involved.